Like the rest of the Californians, I watched the flight of the space shuttle Endeavour over the Golden State from Edwards Air Force Base to Northern California and our State Capitol in Sacramento and the famed Golden Gate Bridge in San Francisco and on its route over Moffett Field, the former naval air station in Mountain View. This was nostalgic for me because my parents operated their farm across the street from the base. My son wanted to drive to Edwards or other sites where the shuttle would be highly visible. However, the commentators on TV covering the flight said all of the sites were crowded and the traffic jams were horrible, as was the parking, so we stayed glued to our TV. Why am I mentioning this anyway? Well, as the shuttle approached the Los Angeles area, one commentator said the flight was nearing Torrance after flying over Santa Monica. When we heard, that we went outside to see if we could catch a glimpse of the historic happening. 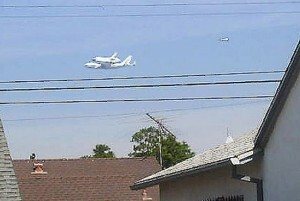 Would you believe the shuttle flew directly over our house on 153rd Street in Gardena? In fact, it was directly overhead, flying parallel to our street. It’s a good thing my son had his camera and got the photo I am including with this column. Yes, I know The Rafu ran a great photo of the shuttle in the previous edition, but the reason I am including it is that a portion of our house can been seen with the shuttle overhead. Who else in California can claim that they have a photo of the historic flight and a piece of their house? I’m going to have the photo enlarged and framed and put on my living room wall and maybe brag about it when we have guests dropping by. Hey, it’s history in the making, and to have my house in the photo with the shuttle is really something. Going back to Moffett Field, when we lived next door to the vital military base, our neighbors always would nod their heads with a “Hi there” when we met each day. But, Dec. 7, 1941 changed their attitude. There were no more familiar greetings. And our address changed from Stierlin Road in Mountain View to 24-10-A at Heart Mountain. Well, back to the present era. One of the stories that made the headlines this past week is that the Los Angeles Dodgers are making a serious bid to sign a Japanese high school pitcher for the next season. Yeah, we Dodger fans might as well look forward to the 2013 season. They ain’t going anywhere this year. I can’t believe that it wasn’t too long ago that they were leading the National League West by seven games. As of today (Sunday, Sept. 23), they are 10 games behind the San Francisco Giants. That’s blowing 17 games in less than a month. Hey, I can’t even blow my nose in that length of time. Well, maybe signing Shohei Otani from Hanamaki Higashi High School will help the Dodgers. Otani, a right-handed pitcher, throws the ball at almost 100 miles per hour. That’s 50 miles per hour faster than I travel in my car after watching the Dodger hitters going hitless and I want to get out of the stadium. Assistant General Manager Logan White of the Dodgers is in Japan and wants to sign Otani after he graduates from high school. White’s meeting with Otani lasted more than an hour and a half at the prepster’s school. He will graduate from high school in March. He announced that he will turn pro but didn’t indicate if it will be in the U.S. He pitched in the all-Japan national high school championship and has drawn considerable interest from professional teams in Japan as well as the U.S. The New York Mets and Boston Red Sox are also interested in signing Otani, which means he’ll be looking at a lot of cash from whoever signs him. Many compare him to Clayton Kershaw, considered one of the top pitchers in the big leagues. Well, let’s hope we can say, “Irasshaimase, Otani-san” if he signs with the local club. Well, maybe then we can refer to the Dodgers as “the local club,” instead of the “loco” club. And the Dodgers may be 10 games in front instead of behind. A lot of folks say that we Nisei don’t have a sense of humor. I disagree. Okay, I’ll get on with my chatter. As I frequently mention in my column, friend Harold Kobata, a devout JACL member, brings me copies of the organization’s newspaper, The Pacific Citizen. It gives me all the up-to-date JACL news. No, I’m not a JACL member. At any rate, in one of the two issues he dropped off this week, there was a story on the new president of the organization. His name is David Lin, a Chinese American. 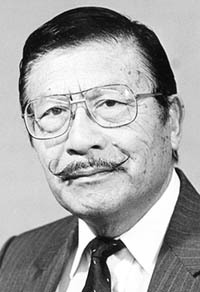 A Chinese American leading an organization with the title “Japanese American Citizens League”? Did I get up from the wrong side of the bed? No, I don’t have anything against Americans of Chinese ethnicity, but don’t we Japanese Americans have an individual who can lead an organization that was founded to serve the interests of Japanese Americans? Well, in glancing at the other members of the board of JACL, the new vice president for planning and development is Jason Chang. The new vice president for the Thousand Club is Jason Moy. The new secretary/treasurer is Matthew Farrells. The new national youth/student chair is Jeff Moy. The new national youth/student rep is Mariko Newton. Oh well, maybe the new board shouldn’t surprise me. On the staff of The Pacific Citizen are Roberta Brown and Hugh Burleson. Where are you, Harry Honda? As I’ve mentioned in the past, perhaps the JACL should change its name to AACL (Asian American Citizens League). Heck, have we forgotten that shortly after Japan bombed Pearl Harbor, Chinese Americans didn’t come to the support of us when anti-Japanese sentiment raged in the U.S.? I wanted to wear a similar button that read, “I am an American,” but nobody ever produced one that had that message indicating our loyalty to the U.S.
With the presidential election only a month away, I get a lot of email from readers, almost all of them in favor of Romney because the writers are all Republicans, as I am. Hey, maybe Obama isn’t such a sure thing. Consider this: I had breakfast with a Nisei friend the other day and we naturally discussed the coming presidential election. The friend, a devout and long-time Democrat, said he is voting for the GOP candidate for the first time since he became a registered voter. Needless to say, I was kind of surprised that he would reveal such a thing, especially to a Republican. Has Obama been such a lousy president? Well, check out this story, which appeared recently in The Japan Times. “Like many Japanese Americans living in Hawaii, Janell Yim loves eating Spam musubi, rice balls made with Spam, and also loves flower arrangement. When she travels, she never forgets to bring back ‘omiage’ for family and friends. “But when it comes to one of Hawaii’s native sons, President Barack Obama, Yim and her fellow island state residents don’t necessarily see eye to eye. ‘Barack Obama was change for the worse,’ said Yim, a 50-year-old social worker, as she stood on the floor of the Republican National Convention in Tampa, Fla., passing out purple leis to fellow conservatives. “In Hawaii, Republicans like Yim are a rare breed. ‘We’re a drop of red in a sea of blue,’ said Sharin Burton, a 48-year-old Japanese American neurologist. “Why aren’t there more Japanese American Republicans? … Beth Fukumoto, who at 30 is running as a Republican for a seat in Hawaii’s state legislature, believes that the gap in party membership is the legacy of postwar racism. Well, another indication that Obama, by simply being a Democrat, may not sweep Hawaii as many predict. • The problem with political jokes is they get elected. • We hang the petty thieves and appoint the great ones to public office. • Politicians are the same all over. They promise to build a bridge over where there is no river. • When I was a boy, I was told that anybody could become president. I’m beginning to believe it. • Why pay money to have your family tree traced? Go into politics and your opponent will do it for you. • Politicians are people who, when they see the light at the end of the tunnel, go out and buy some more tunnel. • I have come to the conclusion that politics is too serious a matter to be left to politicians. I generally enjoy reading your columns and respect that you have a right to your opinions; however, you really did cross the line this time. And the answer is yes to your question about getting up from the wrong side of the bed. You did. However, I must object to your comments about the National JACL and its democratically elected board. True, it is a Japanese-American organization. And yes, it was founded to protect, serve and address issues of importance to the greater Japanese-American community. But JACL is greater than just the Japanese-American community. It is the oldest civil rights organization in the Asian/Pacific American community and has supported a wide range of issues and causes that go above and beyond the Japanese-American community. I am not sure if you know David Lin, Jeff Moy, Jason Moy, but I do. They, along with so many other wonderful people (both Japanese and non-Japanese), have added a level of diversity, knowledge, experience, enthusiasm and energy that is is vital to organizations such as JACL. Mr. David Lin in partcular selflessly donates countless hours to the pan-Asian American communities, offering his energy, experience and leadership talents to help communities grow and thrive. He isn’t doing this to promote himself or to change history, he is doing it because he cares about JACL and the Japanese-American community. I am proud of JACL for having the open-mindedness to be inclusive, not exclusive, and for opening their hearts and minds to an ever changing world. The Japanese-American community needs people like David, Jeff, Jason, Roberta, Matthew, and others who are willnig to devote the time and energy to keep the JACL alive, current and relevant to our community and the greater community outside of our own. I am very proud to call people like David and Jeff my friends. They are generous people who believe that all communities will benefit from a diversity of thought, ideas, interests, personalities, genders, backgrounds and ethnicities. If you met them, I am confident that you will embrace them in the same way I have. So please don’t judge those who volunteer to serve our community so harshly. Rather, our community should applaud them for stepping up when so many others won’t. I wanted to share my two cents regarding George Yoshinaga’s commentary about the JACL Board. While the JACL may have been founded by individuals viewed as being 100% Japanese, the reality is Japanese Americans currently have a very high intermarriage rate resulting in children of mixed ethnicity. If the mother is Japanese and takes her husband’s last name, we may not be able to identify the children as being half Japanese at all strictly based on their last name. Mariko Newton could be an example and I’m only guessing this based on her first name. Along the same lines, he cannot assume a person is 100% Japanese based solely on the last name since the father could have intermarried. The new JACL Board makeup is simply a reflection of the new composition of the Japanese American community. The JACL is adapting so it can continue its history of educating America and the community on the issues. David Lin may not be Japanese, but I have met him and my impression is he is a man of integrity and sensitivity so let’s give him a chance.